Peeled peaches, cut in slices and flavoured with sugar, cocoa and amaretti: the most classical Piedmontese desert. Ingredients Peaches, sugar, amaretti biscuits, sweetened cocoa and cocoa. ALLERGENS: amaretti biscuits which are an ingredient of this produce may contain: eggs, gluten, milk and dairy products, nuts (as stated on the label). For more information on product labels, please contact our Customer Service department. The information on the labels of the products may vary for reasons beyond our control, therefore, there may be discrepancies between the information on the site and that on the products delivered. Please always check the information on the product before consumption or use. 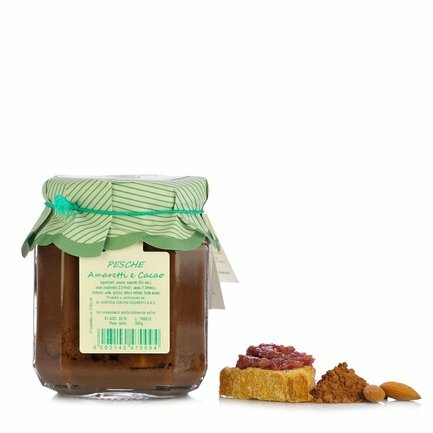 Peeled peaches, cut in slices and flavoured with sugar, cocoa and amaretti: the most classical Piedmontese desert. Put them in a bowl and top them with whipped cream and ice cream. The Cuniberto Michele farming company lies between the hills of Alba and Asti. Its production ranges from products in oil to fruits in syrup, without ignoring the typical specialties of its land.